They play indie rock music, with influences such as Cheap Trick, T Rex and Queen. They share management with They Might Be Giants, with whom they toured before signing to Capitol Records. They served as the house band to the public radio program This American Life on the show's fifth anniversary tour. Ira Glass, the show's host, wrote their first official bio, calling them "living catnip" and describing their songs as "part indie rock, part stadium rock, part straight up pop with the occasional whiff of The Pixies or The Cars or Elliott Smith." In the United Kingdom, "Get Over It", from their self-titled debut album, appeared at No. 21 in the singles chart on March 16, 2003, and the band performed it on that week's edition of Top of the Pops. Also that week, the single's video was named video of the week by Q Magazine. The single was also featured in EA Sports video games Triple Play Baseball and Madden NFL 2003 in 2002. The band contributed a cover of "This Will Be Our Year," the Zombies classic, as the lead track of Future Soundtrack for America, a political benefit album put out by Barsuk Records in the fall of 2004. Lead singer Damian Kulash also became somewhat politically active during that election cycle, writing a heavily downloaded how-to-guide entitled "How Your Band Can Fire Bush" for bands hoping to help unseat President George W. Bush, which garnered him an avalanche of hate mail. The band's second record, "Oh No", was recorded in Malm, Sweden and produced by Tore Johansson (The Cardigans, Franz Ferdinand) in the fall of 2004. Released in August 2005, it gained notoriety for its first single, the Clash-esque "A Million Ways." Its popularity was due in large part to its video, which proved to be a viral internet sensation in the fall of 2005. The ultra-low budget, one-take video featured the band in their back yard performing a dance choreographed by lead singer Kulash's sister, Trish Sie. Using a camera borrowed from a friend, the video was produced for under ten dollars and released without the knowledge or consent of their label, Capitol Records. By November 2005, the video had become the most downloaded music video ever with over 3 million downloads. It also spawned hundreds of tribute performances by amateur dancers around the world, a phenomenon that was encouraged by the group, which sponsored a dance contest, "OK Go Dances with You(Tube)", in which contestants were asked to upload videos of themselves doing the 'million ways dance' to YouTube, which would subsequently be judged, with the winning group of dancers to appear on stage with the band at a future OK Go performance. The nontraditional video for "A Million Ways" is not without precedent for the band. Previous oddball video efforts featuring OK Go include their Ping Pong Instructional Video and the Federal Truth In Music Project. Their next video featured the band dancing on treadmills to the single "Here It Goes Again" from the "Oh No" Album. This video was produced in a similar style to "A Million Ways", and also choreographed by singer/songwriter Damian Kulash's sister, Trish Sie. As with the previous music video for "A Million Ways", "Here It Goes Again" was also recorded as one continuous unedited take, although it required 7 days of rehearsal, and was the best (take 14) of 17 attempts. The amateur and yet brilliantly original 'treadmill video' sparked an even greater viral internet phenomenon than the AMW video, and was subsequently viewed on YouTube and elsewhere online well over 15 million times. On February 11, 2007, the "Here It Goes Again" music video earned the band members of OK Go and Trish Sie the Grammy Award for Best Short Form Music Video. 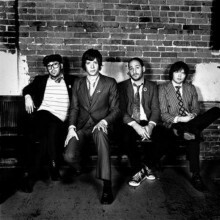 OK Go toured North America with Silversun Pickups and Snow Patrol in 2007. Respected readers if you are reading this, you are on on the subpage of the singer ok go in our eLyricsWorld. Our database consists of data about 52389 artists worldwide as well as 829824 songs 107 of which are from ok go. Except for the the biography of the artist, on this page you can see short piece of information about them, enlists birthdate, style, record label Be versed in all the facts with ok go by adding RSS feed. If you prefer you could directly visit the address you are on right now and look through what's new about the artist.